For anyone with a beloved pet, this delightful and heartwarming story set at the circus shows that quiet qualities like friendship, kindness, and loyalty are important and worthy. 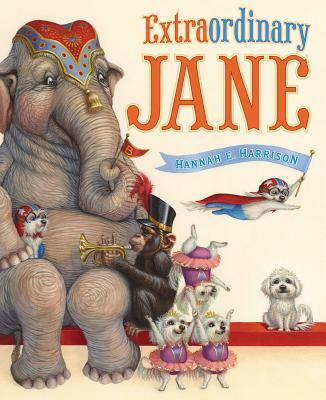 Jane is an ordinary dog in an extraordinary circus. She isn't strong, graceful, or brave like her family. When she tries to be those things, Jane just doesn't feel like herself, but she also doesn't feel special. Is she really meant for this kind of life? Her Ringmaster thinks so, but not for the reasons Jane believes. Hannah E. Harrison is an award-winning painter, specializing in animal subjects, and this is the first picture book she has written and illustrated. She majored in Art and minored in Creative Writing at Colby College in the pursuit of becoming a children's book author/illustrator. She interned for illustrator Kevin Hawkes, with whom she learned about painting in acrylics. Hannah grew up in New Hampshire, and now lives in Oklahoma with her husband and daughter.